Shame on Yale University’s Tony Reno for his display of poor sportsmanship. 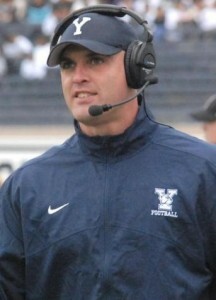 It’s bad karma, Coach Reno (photo from Yale). Ivy League competition on the gridiron need not be unclassy. In Ivy League sports, coaches of rival teams often share a mutual respect for their counterpart’s program. It’s not like Harvard vs. Penn or Yale vs. Dartmouth is Florida vs. Florida State in football or Duke vs. UNC in basketball. But this year during the Ivy League football season, the head coach of the Yale football team demonstrated a lack of class and a lack of respect for his Ivy League counterpart at Dartmouth, Buddy Teevens. Shame on Bulldogs head coach Tony Reno for not sharing a kicking tee with an Ivy League opponent. Was he that insecure? Apparently he should have been since his team lost for the first time in a decade. What was it to him to share a kicking tee? His equipment manager had showed class by sharing it. He showed a lack of class by asking for it back. Good for Dartmouth’s inventive backup kicker to come up with a solution. What a good idea to use part of a water bottle. Shame on Yale University’s Tony Reno for displaying a lack of sportsmanship. His actions are counter to the philosophies of Ivy League competition in sports.